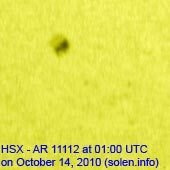 Last major update issued on October 14, 2010 at 04:15 UTC. The geomagnetic field was quiet on October 13. 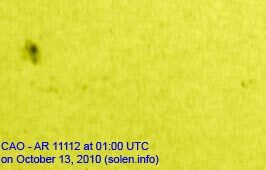 Solar wind speed ranged between 299 and 380 km/s. 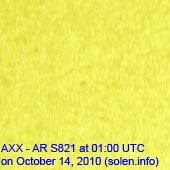 Solar flux measured at 20h UTC on 2.8 GHz was 78.1 (down 4.4 over the last solar rotation). The planetary A index was 4 (STAR Ap - based on the mean of three hour interval ap indices: 4.5). Three hour interval K indices: 21211111 (planetary), 22221111 (Boulder). Region 11112 decayed slowly and quietly. 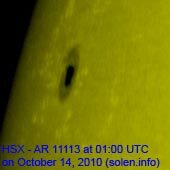 New region 11113 rotated into view at the northeast limb. October 12-13: No obviously Earth directed CMEs were seen in LASCO or STEREO images. No significant coronal holes are currently in or near Earth facing positions. The remains of a once large coronal hole have rotated into view near the northeast limb. 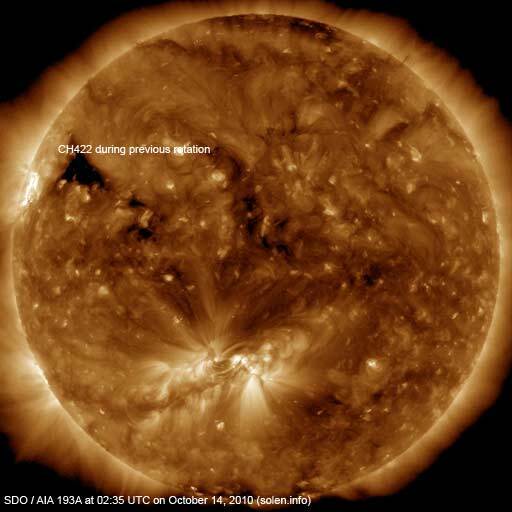 The quick rate of decay observed 3-4 weeks ago has continued while the coronal hole was on the backside of the sun. An emerging coronal hole will be rotating into view over the next couple of days. The geomagnetic field is expected to be quiet on October 14. 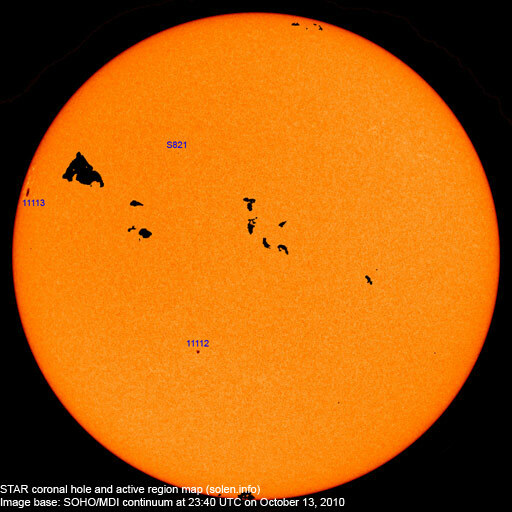 Quiet to active conditions are possible October 15-16 due to CME effects.